This is my absolute favorite healthy, warming beverage for fall. Today I share two versions. Classic Ginger-Lemon and Apple-Spice Ginger. If you have never tasted fresh ginger tea, and experienced the health benefits, then you are in for a treat. 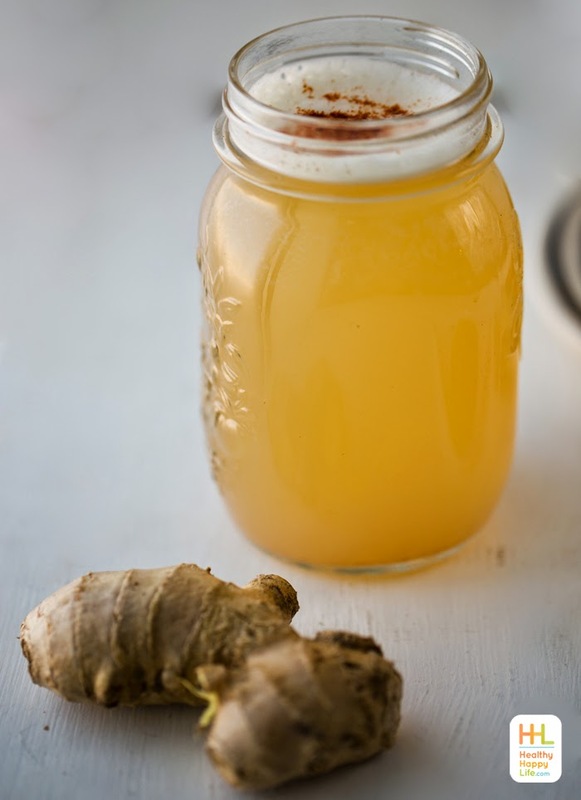 Warming, spicy ginger is excellent for digestion and warming the body from the inside out. I sip ginger tea just upon rising with loads of bright lemon, in the afternoon with a hint of maple syrup as sweetener and also after dinner, as a spicy digestion-enhancing beverage. Once you learn how to make basic ginger tea, using my super-speedy method, you will be livening it up in all sorts of creative ways!.. * Sip between meals to curb cravings. * ZERO Caffeine. Yet, I can attest that it provides quite an energizing BUZZ. * If prepared as shown, 40 calories per cup, yet still offers a nice sweet sip flavor. You could omit the sweetener, add more or substitute with a whole apple for sweetness. * Warming and soothing for your nerves. * Can settle an upset tummy. * Brings bliss and joy because it tastes so yummy! * Spicy flavors to stimulate your spirit. 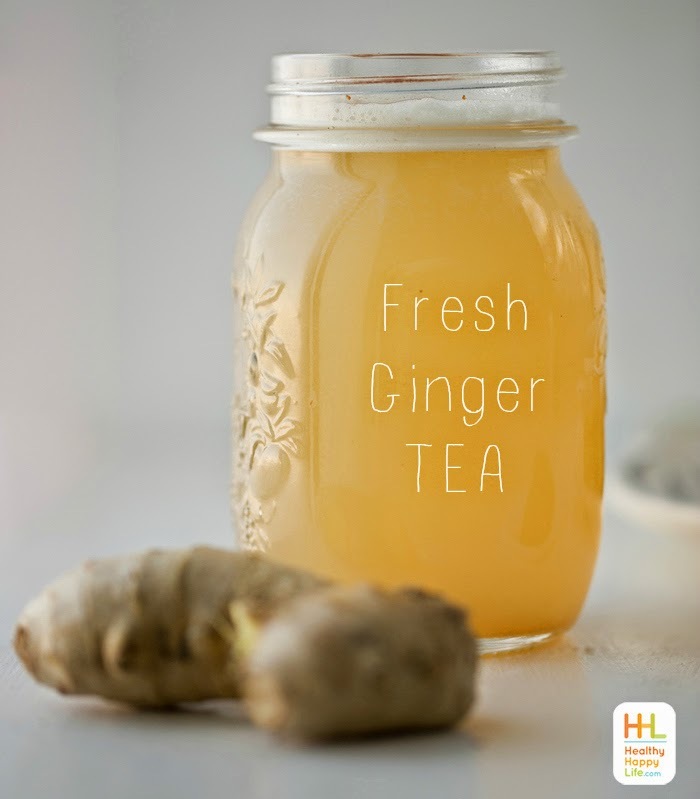 Most ginger tea recipes ask that you simply steep the peeled ginger root for a good 15-30 minutes to really extract that ginger flavor. But by using a vitamix high-speed blender, I can cut that steeping and simmering time in half. I blend, steep, then strain. Apple-Spice Ginger Tea Upgrade: Prepare according to directions below, but instead of adding the maple syrup to sweeten at the end, pour the hot ginger lemon tea back into the high speed blender, Vitamix, and blend from low to high until the apple is pulverized. Then strain the liquid through a mesh cloth or nylon mesh bag (the kind used for almond milk). Your ginger-tea will now be apple infused! You can serve right away or re-simmer on the stovetop. Additional sweetener will be neede if you like a brighter sweetness for your tea. Try adding maple, coconut sugar or agave. 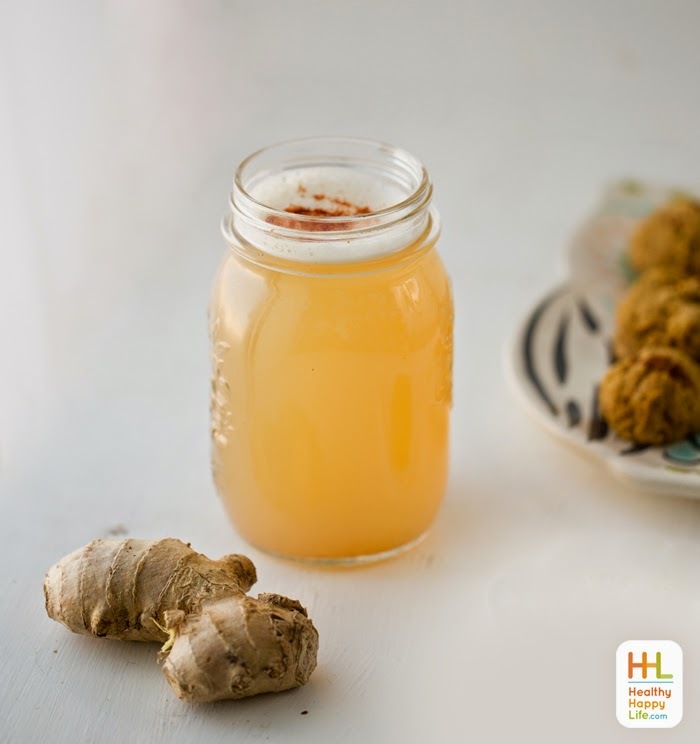 This homemade spicy, warming, sassy-sweet ginger tea is made using fresh ginger, lemon and spices. Amazingly soothing most any time of day! Add 2 cups of water and the fresh ginger to a high speed blender. Blend from low to high for about 60 seconds, until the water turns a light yellow color and all of the ginger has been pulverized. A few tiny clumps is OK, as they will be strained later. When the simmering time is up, pour the tea back into the blender container, but use a mesh strainer to catch any of the ginger pulp and particles. A large mesh strainer will make things easiest, although a small strainer could work too. You could also use a nut milk back if needed. Add the lemon juice, cayenne and sweetener to the blender as well and do a quick thirty second blend on low to mix the ingredients. Take a sip and add additional cayenne or sweetener to taste. Serve warm. Store leftovers in the fridge and serve chilled or re-warm in a microwave or on your stovetop. Or even in your blender on "soup" setting.